Last week, I talked about backing up your computer, since backups are a great thing to think about at the start of a new year. This week I thought I’d address another question photographers often have at the new year, related to Adobe Lightroom. I have used Lightroom since 2011, and do almost all my photo editing in Lightroom. Over the years I’ve become a Lightroom fan and somewhat of an expert, so I’ll be doing at least one Lightroom tip each month. 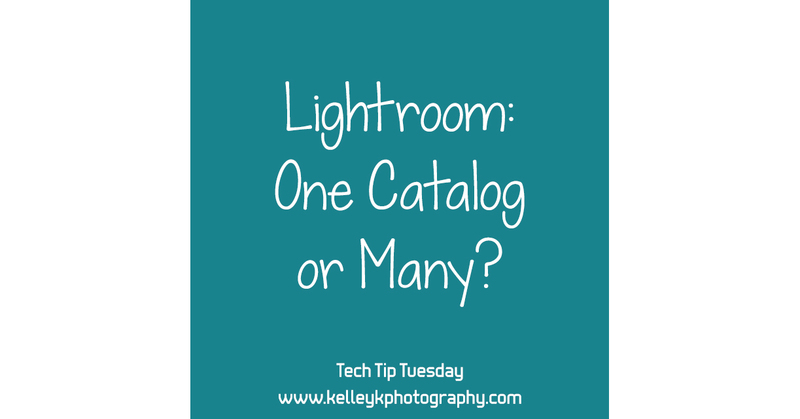 A lot of people wonder if they should have one big Lightroom catalog, or if they should start new catalogs each year, or for each session, etc. I recommend keeping everything in one large catalog, and there are many benefits to doing this, but I know there are reasons to do things different ways. There are a lot of benefits to using a single Lightroom catalog, and I’ve tried to address them all below. 1. The organizational tools in Lightroom are designed for one catalog. Lightroom’s catalog is a vast database of all the photos imported into it. If you import all your photos into one place, you can use all the organizational tools as they were intended. With one catalog, I can easily pull up my images by any keywords, ratings, etc. that I want. So I can find all my 5-star images of siblings, or all my images at a certain location, all my flower macros, etc., and then export them at whatever specs I need for the situation. This makes things very easy when putting together a portfolio or when selecting and submitting photos for contests, etc. People often draw a comparison between Lightroom and a library’s electronic card catalog. Imagine if the library had separate catalogs for each author. It would make it very hard to find all the books about photography, or books suitable for a certain reading level. Having all the books (or photos) in the same catalog lets you sort, filter, search, etc. in almost any way you can image across every book (or photo) available. Here I’ve filtered all my 5-star images from 2016 shot with my Tokina 100mm f/2.8 macro lens. 2. Lightroom is built to handle large catalogs. There are a lot of rumors about Lightroom having a max limit of photos before it slows down or stops working, and I’ve even heard of some Adobe tech support people spreading these rumors. But the bottom line is that they simply aren’t true. In reality, a single Lightroom catalog can hold virtually an unlimited number of photos. Adobe themselves have clearly stated that there is “no upper limit to the number of photos you can have in a catalog.” I have almost 100,000 photos in one Lightroom catalog, and it’s less than 3GB in size. Photos aren’t actually stored in Lightroom, and Lightroom catalogs are just a very small fraction of the size of your photos. Using multiple catalogs to avoid some imaginary limit in Lightroom or for perceived performance benefits is completely unnecessary. Performance issues are almost always related to something other than catalog size. 3. Lightroom Mobile can only sync one catalog. I love syncing my catalog with Lightroom mobile so that I can cull and do some quick edits from a browser or tablet. However, Lightroom Mobile can only sync with one catalog at a time. So if you use multiple catalogs, you have to decide which one should be setup to sync. If you have the Adobe CC Photography plan, Lightroom Mobile is a great feature, and this is a big reason to use one catalog. 4. One catalog ensures keyword consistency. While your presets are shared across multiple catalogs, your keyword list is not, so it’s very easy to introduce inconsistency in your keywords if you use multiple catalogs, for example using the keyword “family” in one catalog and “families” in another, or even inconsistent capitalization. Unfortunately, keywords are less helpful if they aren’t consistent across all of your images. With multiple catalogs, you’ll be starting over with your keyword list every time, and you won’t have your full list of consistent keywords to choose from. 5. Catalog management is much simpler with one catalog. This is reason is actually four reasons in one. There are several aspects of managing and maintaining Lightroom catalogs that is significantly easier if you have one catalog. Having extra catalogs mean extra catalogs to backup, and it’s easy to get confused about what catalog is backing up where. It adds a level of complexity and confusion to managing Lightroom backups. You always have to make sure you’re importing to the right catalog. This can be especially frustrating if you have multiple shoots on the same card that you want in different catalogs. Sometimes when you upgrade Lightroom, it requires you to update your catalog. This is much easier if you only have one catalog to upgrade, instead of having numerous catalogs that are all at different Lightroom versions. Synchronizing with Lightroom publishing services like SmugMug and Flickr is much more complicated if you have multiple catalogs. Despite the many benefits to using a single Lightroom catalog, there may be reasons for maintaining multiple catalogs that make sense to your situation. Although I strongly prefer having one Lightroom catalog, I actually have two main catalogs – one personal and one for clients. I used to have it in one catalog, but I split it up about a year ago, to help me separate my working hours from my personal editing time. Dividing these two catalogs has helped me so I am not distracted by personal images when I’m trying to work. While I know I am giving up a lot of benefits of having everything in one catalog, it’s important for my productivity to have them separated. One thing that makes it easier is that there’s a very obvious division between client and personal photos, so if I’m looking for a photo, it’s easy to know which catalog it would be in. Another reason you may prefer multiple catalogs is if you want to separate boudoir or birth images from the rest of your images for client privacy. But carefully consider the decision to use multiple catalogs, as there are several downsides. Even though I separated my client photos to a separate catalog, I regularly consider merging them back so that I can stop switching back and forth and can easily see all my client and personal images together. Sometimes your workflow necessitates using a separate catalog for each session. This may be the case if you’re a photographer who outsources their edits to someone else. A common way to work with an editing outsourcer is to send a catalog with Smart Previews. So if you use an editing service, it may make sense for your workflow to just keep every session in a separate catalog. If you do this, I recommend exporting your favorite images from each session in high-resolution and saving them in a single folder. This will allow you to easily locate and work with your best client images all in one place in the future, like your best bridal portraits or your best engagement ring macros. Thank you so much for your Tech Tips Tuesday. I try to follow your posts on the Clickin Moms website as I’ve learned so much about the tech side of things. In a future Tech Tips, would you consider addressing how to maintain one Lightroom catalog and keep only current year photos on a laptop while keeping previous year photos on an EHD (that is backed up, of course)? I’m sure it’s straightforward; I’m still just a novice when organizing my photos and optimizing my laptop performance. Thanks, Susannah! You can easily move your past years’ images to an EHD. If you can already see your EHD in the Folders section of the Lightroom Library Panel, just drag the folders containing your old images to the EHD. If you don’t see the EHD in Lightroom already, you can move a folder to the EHD outside of LR, then right-click that folder in the LR Folder Library, and select “Update Folder Location” to point Lightroom to the new location of the folder on the EHD. Once you do one folder that way, you’ll see the EHD in LR and can drag the folders like I described at first. You can use Smart Previews to work with images on the EHD when it’s not connected. I’ll definitely be doing a tech tip on that in the future! Thanks so much for taking the time to put these together Kelley!! I have a question about backing up my LR catalog. I back up my catalog to an EHD that is backed up to Backblaze. At some point my back up ended up going to my internal hard drive by mistake. I went in and copied all those little zip folders into my EHD where I want my backup to be located, and changed my settings in LR so I’m now backing up my catalog to my EHD once again. Now that I’ve copied my LR back up files, can I go ahead and delete my LR back up folder from my computer?? Thanks so much!! Missy, I’m glad you found this helpful. I am always hesitant about deleting files, but if you’re certain you’ve copied those backup zip files over to the EHD, you can safely delete them from your primary drive. In the future, I always recommend moving files instead of copying them, because then they’ll be automatically deleted, once the computer is certain they are safely in the new location. Then you never have to worry about whether or not it’s safe to delete. I have ALWAYS wondered about LR Catalogs! From the beginning I have always only used one and always wondered why anyone would want to use more than one and found that very confusing. Thanks for confirming that me using one catalog is the way to go! I am very intrigued by #3 and would love to know how you use LR Mobile more! I haven’t really gotten into this and I feel like I am missing out on a big benefit! Thanks so much for your tips! Jennifer, I’ll definitely be doing a Tech Tip on Lightroom Mobile in the near future. I love it! I should use it more than I already do really, because I find I’m super productive with it.